(Francisco Kjolseth | The Salt Lake Tribune) Critical Care Specialist Dr. Felix Leung provides medical guidance for a patient from the Telecritical Care Center in Middle. Intermountain Healthcare announced the launch of one of the nation's largest virtual hospital services. It will involve 500 caregivers, offering telehealth services on everything from basic care to stroke evaluation and newborn critical care. The Virtual Hospital Services Testing Laboratory showcased several medical services on Wednesday, Feb. 28, 2018, in Midvale. (Francisco Kjolseth | The Salt Lake Tribune) Tim Lovell, Business Manager for Connect Care Direct to Consumer Telemedicine for Intermountain Healthcare demonstrates the way various ways patients and doctors can connect to address medical needs. Intermountain Healthcare opened a new hospital without buildings or walls with one of the nation's largest virtual hospital services. It will involve 500 caregivers, offering telehealth services on everything from basic care to stroke evaluation and newborn critical care. The Virtual Hospital Services Testing Laboratory showcased several medical services on Wednesday, Feb. 28, 2018, in Midvale. 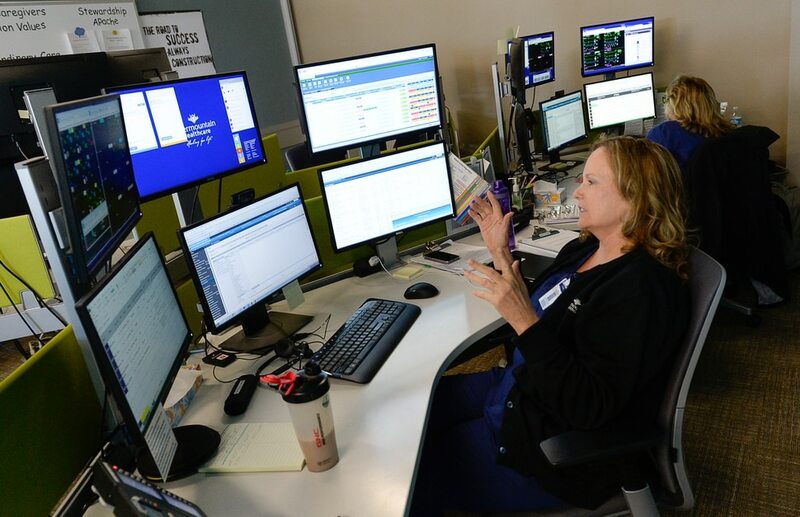 (Francisco Kjolseth | The Salt Lake Tribune) Critical Care Nurse Crystal Hale connects with doctors and patients remotely from the Telecritical Care Center in Midvale. Intermountain Healthcare announced the launch of one of the nation's largest virtual hospital services. It will involve 500 caregivers, offering telehealth services on everything from basic care to stroke evaluation and newborn critical care. The Virtual Hospital Services Testing Laboratory showcased several medical services on Wednesday, Feb. 28, 2018,. (Francisco Kjolseth | The Salt Lake Tribune) Heidi Nedreberg, Marketing Manager for Connect Care Pro describes scenarios of newborn care with the help of nurse Lory Maddox, projected remotely on screen. Intermountain Healthcare announced the launch of one of the nation's largest virtual hospital services. It will involve 500 caregivers, offering telehealth services on everything from basic care to stroke evaluation and newborn critical care. The Virtual Hospital Services Testing Laboratory showcased several medical services on Wednesday, Feb. 28, 2018, in Midvale. (Francisco Kjolseth | The Salt Lake Tribune) Jim Sheets, Vice President for Outreach Services at Intermountain Healthcare announces the launch of one of the nation's largest virtual hospital services. It will involve 500 caregivers, offering telehealth services on everything from basic care to stroke evaluation and newborn critical care. The Virtual Hospital Services Testing Laboratory showcased several medical services on Wednesday, Feb. 28, 2018, in Midvale. (Francisco Kjolseth | The Salt Lake Tribune) Jim Sheets, Vice President for Outreach Services at Intermountain Healthcare announces the launch of one of the nation's largest virtual hospital services, as he describes newborn care with the help of nurse Lory Maddox, projected remotely on screen. It will involve 500 caregivers, offering telehealth services on everything from basic care to stroke evaluation and newborn critical care as bedside doctors can receive medical expertise from other professionals remotely. The Virtual Hospital Services Testing Laboratory showcased several medical services on Wednesday, Feb. 28, 2018, in Midvale. (Francisco Kjolseth | The Salt Lake Tribune) Nurse Jenny Williams, left, and Doctor Rachel Parbhu, connect doctors and patients remotely from the Telecritical Care Center in Midvale. Intermountain Healthcare announced the launch of one of the nation's largest virtual hospital services. It will involve 500 caregivers, offering telehealth services on everything from basic care to stroke evaluation and newborn critical care. The Virtual Hospital Services Testing Laboratory showcased several medical services on Wednesday, Feb. 28, 2018,. 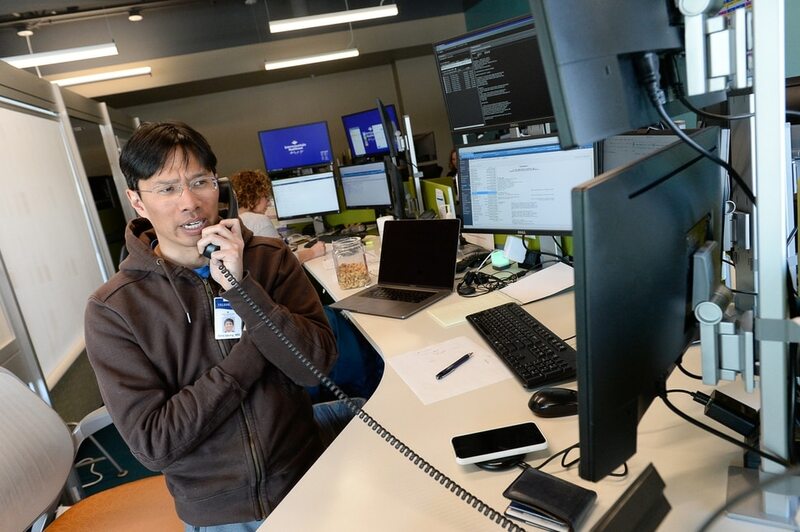 (Francisco Kjolseth | The Salt Lake Tribune) Doctor Rachel Parbhu, connects with doctors and patients remotely from the Telecritical Care Center in Midvale. Intermountain Healthcare announced the launch of one of the nation's largest virtual hospital services. It will involve 500 caregivers, offering telehealth services on everything from basic care to stroke evaluation and newborn critical care. The Virtual Hospital Services Testing Laboratory showcased several medical services on Wednesday, Feb. 28, 2018. (Francisco Kjolseth | The Salt Lake Tribune) Tara Larkin, Operations Director for TeleHealth Services at Intermountain Healthcare is joined by critical care nurse Vanessa Washington, on screen, as they demonstrate the mechanics of proving virtual care in a hospital room. Intermountain Healthcare launched a new hospital without building or walls with one of the nation's largest virtual hospital services. It will involve 500 caregivers, offering telehealth services on everything from basic care to stroke evaluation and newborn critical care. The Virtual Hospital Services Testing Laboratory showcased several medical services on Wednesday, Feb. 28, 2018, in Midvale. (Francisco Kjolseth | The Salt Lake Tribune) Tim Lovell, Business Manager for Connect Care Direct to Consumer Telemedicine for Intermountain Healthcare demonstrates the way various ways patients and doctors can connect to address medical needs. 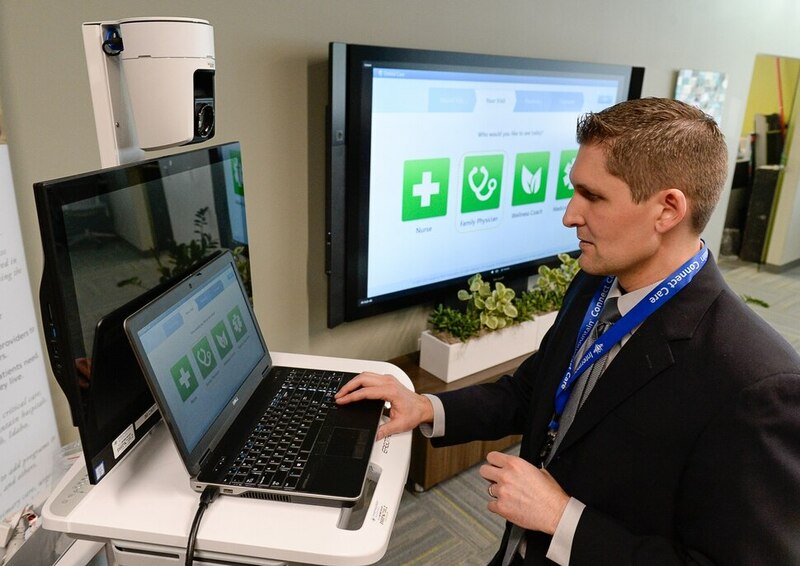 Intermountain Healthcare opened a new hospital without buildings or walls with one of the nation's largest virtual hospital services. It will involve 500 caregivers, offering telehealth services on everything from basic care to stroke evaluation and newborn critical care. The Virtual Hospital Services Testing Laboratory showcased several medical services on Wednesday, Feb. 28, 2018, in Midvale. (Francisco Kjolseth | The Salt Lake Tribune) Heidi Nedreberg, Marketing Manager for Connect Care Pro describes scenarios of newborn care with the help of nurse Lory Maddox, projected remotely on screen. Intermountain Healthcare announced the launch of one of the nation's largest virtual hospital services. It will involve 500 caregivers, offering telehealth services on everything from basic care to stroke evaluation and newborn critical care. The Virtual Hospital Services Testing Laboratory showcased several medical services on Wednesday, Feb. 28, 2018, in Midvale. (Francisco Kjolseth | The Salt Lake Tribune) Heidi Nedreberg, Marketing Manager for Connect Care Pro describes scenarios of newborn care with the help of nurse Lory Maddox, projected remotely on screen. Intermountain Healthcare announced the launch of one of the nation's largest virtual hospital services. It will involve 500 caregivers, offering telehealth services on everything from basic care to stroke evaluation and newborn critical care. The Virtual Hospital Services Testing Laboratory showcased several medical services on Wednesday, Feb. 28, 2018, in Midvale. Intermountain Healthcare began tinkering with telemedicine five years ago. The Utah-based nonprofit healthcare system rolled out a service where patients could remotely chat on their smartphones with doctors about basic medical problems. Another push was aimed at physicians in rural areas, offering live-streamed consulting expertise on difficult medical issues such stroke evaluation, mental health counseling and premature birth. Intermountain officials on Wednesday announced they now are doubling down on this “virtual hospital” strategy, joining many other large hospital systems around the country in deploying technological advancements in hopes of providing easier and less expensive care. The company currently has 35 telemedicine programs, but they are “fragmented” at medical facilities around the state, said Jim Sheets, an Intermountain vice president. So officials said they plan to bring all those efforts under one roof — a 20,000-square foot facility in Murray near Intermountain Medical Center. The site will initially house about 150 of Intermountain’s doctors and other medical experts, Sheets said. Collectively, these offerings of virtual services will be called Intermountain Connect Care Pro. Officials said it will be one of the nation’s largest virtual hospital services, serving all of Intermountain’s 22 hospitals and 180 clinics, along with nine hospitals outside the system. The goal is to care for patients closer to home, and only transfer them to large medical centers in the most dire situations. “We really want to bring bring our critical care specialities and abilities to wherever the sick patients are,” said David Guidry, an assistant medical director for the hospital’s TeleCritical Care program. As part of the telemedicine push, the hospital system said it also plans to locate patient kiosks in typically underserved areas, giving access at places such as schools, community centers and homeless shelters. The kiosks are equipped with several diagnostic tools, such a thermometer and scale, and patients can receive a virtual check-up from a doctor via a computer screen. One of the kiosks, already in place at the Columbus Center in South Salt Lake, is meant to serve the refugee community. Intermountain officials said they also plan to expand translation services for non-English speakers. Officials on Wednesday showed several of the telemedicine technologies they have developed at the company’s testing laboratory in Midvale. In one example, they demonstrated the ability of a family practice doctor in rural Utah to get help from a neonatologist in Salt Lake City when it appeared a baby might be born prematurely. This allows the doctor to have an expert looking over his shoulder for a potentially complicated birth process, Sheets said. It also would allow the family to stay at their local hospital, instead of having to travel to a urban medical center. Avoiding that travel can save about $18,000, officials said. And since the telemedicine service for newborn critical care began three years ago, it is estimated to have saved patients a total of about $2.1 million. Telemedicine also is useful for mental health issues, because rural communities — such as Kanab — have few locally based psychiatrists or other mental health professionals. Sheets said Intermountain is following in the footsteps of several other large hospital systems pushing to expand telemedicine services, especially in rural areas. They include Avera Health, in South Dakota, and Mercy Health based in St. Louis. University of Utah Health, based in Salt Lake City, also has a sizeable telemedicine program. So far, Guidry said, the data is promising.